Using a food processor, combine basil leaves, garlic, and pine nuts. Pulse until well blended. Gradually drizzle in 1/2 cup cannabis infused olive oil and Parmesan cheese and continue pulsing until all ingredients are well combined. Pesto should be thick. Season with salt and fresh ground black pepper to taste. Thinly slice zucchini lengthwise. Brush with olive oil and season lightly with salt and pepper. Grill on medium to medium high heat until you get some marks on both sides and they are tender. About 1 minute per side. Let cool. 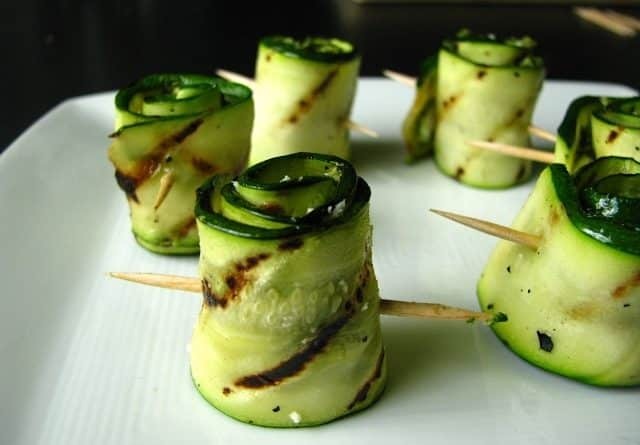 Spread about a teaspoon of pesto on 1 side of each grilled zucchini slice and roll up. Secure with a toothpick and serve.